As with the 1986 version, it ain't happy; both movies are essentially tragedies at their hearts, though the remake is much more powerful since the original puts too much of a “feel good” spin on the sad events. Nonetheless, it's a surprisingly somber piece for the era, and it rarely descends to the level of campiness I expected. As silly as it can be - mainly due to the weak effects - it still seems pretty creepy. I was even a bit spooked by those eerie cries of "help me!" 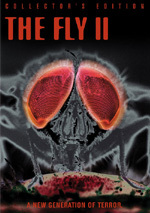 The Fly appears in its original theatrical aspect ratio of approximately 2.35:1 on this single-sided, single-layered DVD; the image has been enhanced for 16X9 televisions. No major issues materialized here, but the transfer never became particularly strong. Sharpness displayed the most significant distractions. A mix of shots came across as a bit soft, especially in wider elements. Much of the movie showed fairly good definition, but too much of it tended to seem less than concise. No issues with jagged edges or shimmering occurred, but I saw some mild edge enhancement at times. Source flaws stayed modest. A few specks cropped up through the flick and that was it, as it usually looked clean. Colors were also erratic but generally good. The movie didn’t boast a particularly dynamic palette, and it occasionally tended toward the slightly bland side of the street. However, the tones mustered nice reproduction most of the time, and the smattering of brighter hues looked nice. Black levels could come across as a little flat and murky, but for the most part they appeared deep and nicely dark, with solid tones that didn't look too heavy. Shadow detail was similarly fine, as the low-light situations displayed appropriate levels of nuance without excessive thickness. Ultimately, The Fly remained completely watchable, but the different concerns knocked it down to a “B-“. As for the Dolby Surround 4.0 soundtrack, it provided a relatively active sonic environment. Lots of audio came from the side channels and the rears contributed some useful atmosphere at appropriate times. The mix worked well when we heard music or effects. These filled the space nicely with elements that created a nice sense of environment. However, dialogue lacked consistent localization. Most of the lines seemed accurately placed, but some of them blended with the wrong speakers, and this could become a minor distraction. Audio quality was dated but decent. Speech tended to be slightly stiff. However, the lines seemed concise and lacked edginess or other problems. Music came across as a bit metallic as well, and range wasn’t great. Nonetheless, the score was acceptably bold for its age and seemed well-reproduced. Effects fell into the same realm, as they showed their age but remained clear and fairly accurate. For the most part, I liked this track. It wasn’t perfect, but it was definitely above average for a film from 1958. How did the picture and sound of this 2007 release compare to those of the old 2000 release? Audio was pretty similar for both, but this DVD’s visuals offered substantial improvements. The 2000 DVD was extremely soft and suffered from exceedingly flat colors along with some source flaws. The new release had its problems, but it looked cleaner, sharper and brighter. There’s no contest; the 2007 Fly offered radical improvements in visual quality, as the 2000 image was a mess. As far as extras go, this platter includes only one: an audio commentary from actor David “Al” Hedison and film historian David Del Valle. Both sit together for this running, screen-specific discussion. They chat about the original story on which the film is based, cast and crew, and general memories from the set. While it doesn’t compare favorably with its 1986 remake, the original 1958 Fly has creepy charms of its own. Yeah, it becomes cheesy at times, but it provides a reasonably effective little horror tale. 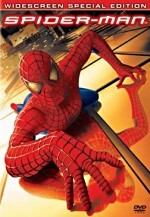 The DVD offers erratic but usually positive picture and audio along with a decent audio commentary. This is definitely the best version of The Fly you’ll find. 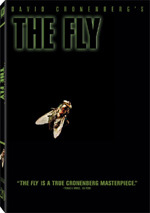 Note that this version of The Fly comes only as part of the four-disc “The Fly Collection”. 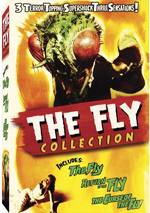 That set also includes Return of the Fly, Curse of the Fly, and a fourth disc with supplements. The “bonus” grade provided here only reflects the content of this particular platter; the review of the fourth disc will give an extras grade for the set as a whole.